Custom Size Shower Curtains & Rods Made to Order! Combining elegance with durability, Bradford's of Tampa has been dedicated to serving the designer trades nationwide since 1985. Custom made to your specifications in a variety of fabrics, colors, and sizes our shower curtains are designed with the highest quality in mind. From nylon shower curtains to cubicle tracks, from ecologically friendly fabrics to ceiling mount systems, we're sure you will find just what you need at Bradford's! We also provide curtains for commercial and institutional use such as ten gauge vinyl, flame retardant fabrics and vinyls and cubicle curtains. 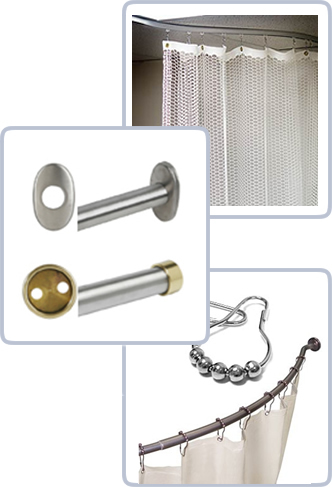 To complete your design, we have an assortment of shower rods and roller hooks. We stock most shower curtains in 72" wide and some in 104" wide, and in 72", 78", 84", 96" and 108" lengths. If you need wider or longer curtains, please don't hesitate to contact us for custom curtains made to your special size. Our straight stainless steel shower curtain rods are available in polished and satin finishes in 1" and 1¼" diameter in 60", 72", 84" and 96" lengths. Please contact us for custom lengths. If you have a questions, or a special need, please contact us . We will be happy to help you! Custom Length & Width Shower Curtains from Bradford's of Tampa - custom shower curtains made to your width and length specifications. Also supplying commercial and industrial clients with custom shower curtains since 1985.